Capri is a fresh and versatile addition to the Krug family of multipurpose seating. 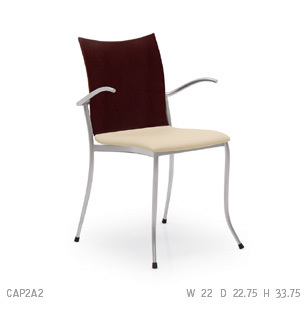 Its light yet appealing look, stackability, and a multitude of chair styles makes Capri an ideal fit for almost any environment. Capri is available in arm chair, side chair or barstool versions, fully upholstered or upholstered seat, wood, wood with holes, or upholstered with holes. A stacking caddie is also available.